The TIDA-00847 TI design showcases space and cost optimized architecture for a 4 channel DC input binary module with improved measurement accuracy and status indication using only two TI products simplifying system design. 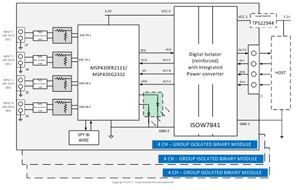 MCU based binary module improves measurement resolution of binary input resulting in improved system performance including accurate and repeatable fault indications and eliminates the need for multiple hardware versions (use same design for multiple nominal voltage inputs) reducing design, testing, manufacturing and field support efforts. 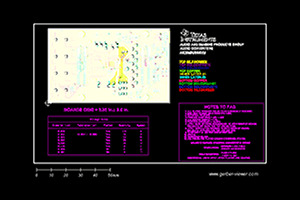 In this TI design 4 input channels are configured as group isolated inputs to minimize cost per channel. 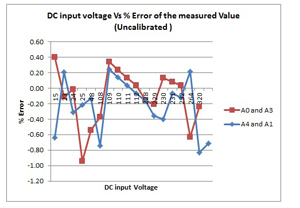 A 10-bit analog-to-digital converter (ADC) measures the DC inputs with in ±3% ±1 V accuracy over wide range. Pre-compliance tests for EMI and EMC have been performed.